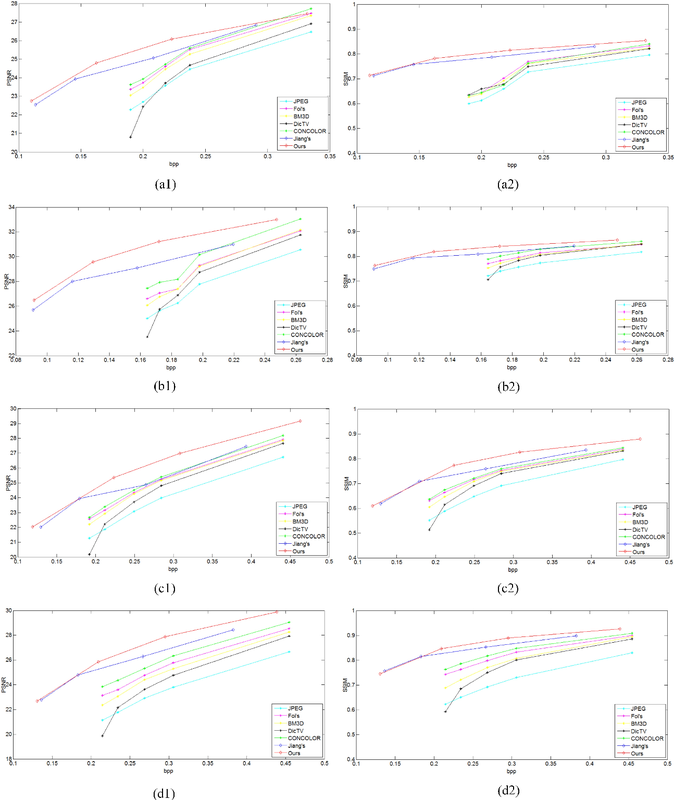 In this paper, we propose a deep multiple description coding framework, whose quantizers are adaptively learned via the minimization of multiple description compressive loss. Firstly, our framework is built upon auto-encoder networks, which have multiple description multi-scale dilated encoder network and multiple description decoder networks. Secondly, two entropy estimation networks are learned to estimate the informative amounts of the quantized tensors, which can further supervise the learning of multiple description encoder network to represent the input image delicately. Thirdly, a pair of scalar quantizers accompanied by two importance-indicator maps is automatically learned in an end-to-end self-supervised way. Finally, multiple description structural dis-similarity distance loss is imposed on multiple description decoded images in pixel domain for diversified multiple description generations rather than on feature tensors in feature domain, in addition to multiple description reconstruction loss. Through testing on two commonly used datasets, it is verified that our method is beyond several state-of-the-art multiple description coding approaches in terms of coding efficiency. 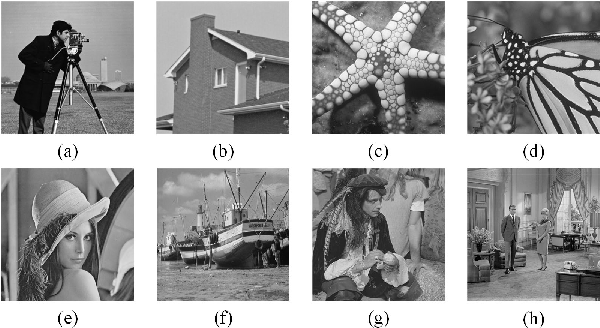 In this paper, we propose an image re-sampling compression method by learning virtual codec network (VCN) to resolve the non-differentiable problem of quantization function for image compression. Here, the image re-sampling not only refers to image full-resolution re-sampling but also low-resolution re-sampling. We generalize this method for standard-compliant image compression (SCIC) framework and deep neural networks based compression (DNNC) framework. 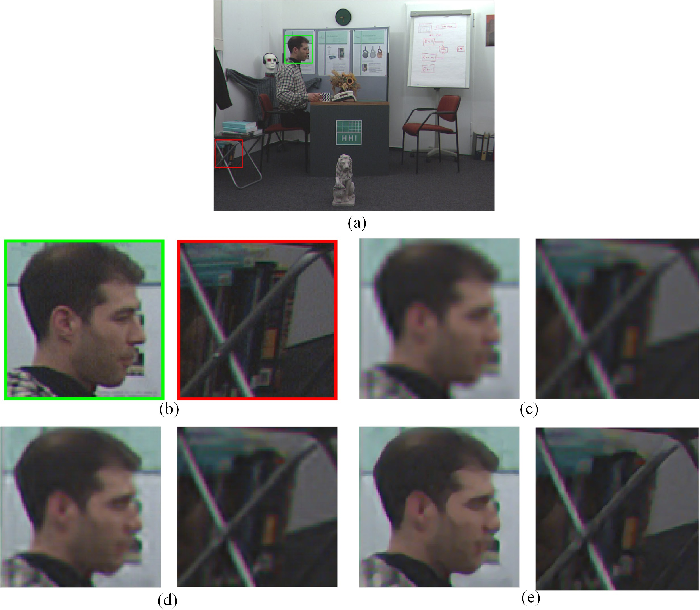 Specifically, an input image is measured by re-sampling network (RSN) network to get re-sampled vectors. Then, these vectors are directly quantized in the feature space in SCIC, or discrete cosine transform coefficients of these vectors are quantized to further improve coding efficiency in DNNC. At the encoder, the quantized vectors or coefficients are losslessly compressed by arithmetic coding. At the receiver, the decoded vectors are utilized to restore input image by image decoder network (IDN). In order to train RSN network and IDN network together in an end-to-end fashion, our VCN network intimates projection from the re-sampled vectors to the IDN-decoded image. As a result, gradients from IDN network to RSN network can be approximated by VCN network's gradient. Because dimension reduction can be further achieved by quantization in some dimensional space after image re-sampling within auto-encoder architecture, we can well initialize our networks from pre-trained auto-encoder networks. Through extensive experiments and analysis, it is verified that the proposed method has more effectiveness and versatility than many state-of-the-art approaches. Multiple description coding (MDC) is able to stably transmit the signal in the un-reliable and non-prioritized networks, which has been broadly studied for several decades. However, the traditional MDC doesn't well leverage image's context features to generate multiple descriptions. 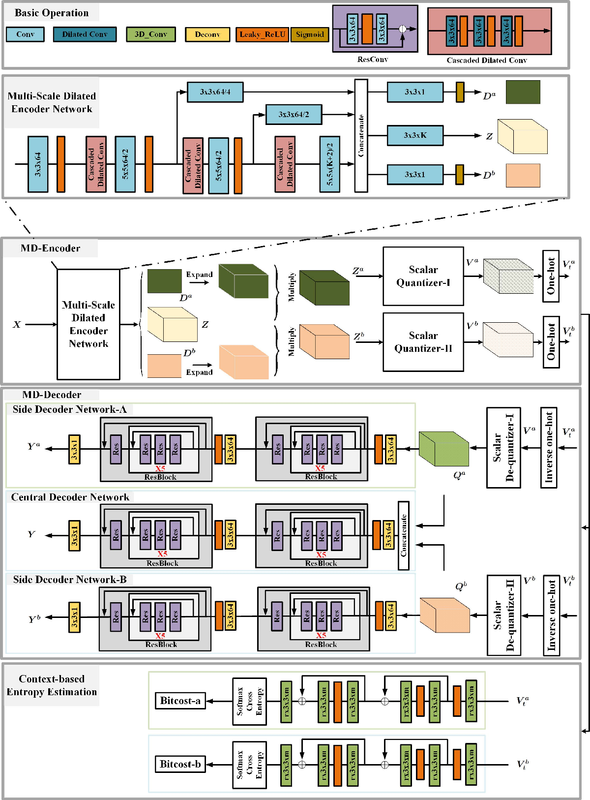 In this paper, we propose a novel standard-compliant convolutional neural network-based MDC framework in term of image's context features. Firstly, multiple description generator network (MDGN) is designed to produce appearance-similar yet feature-different multiple descriptions automatically according to image's content, which are compressed by standard codec. 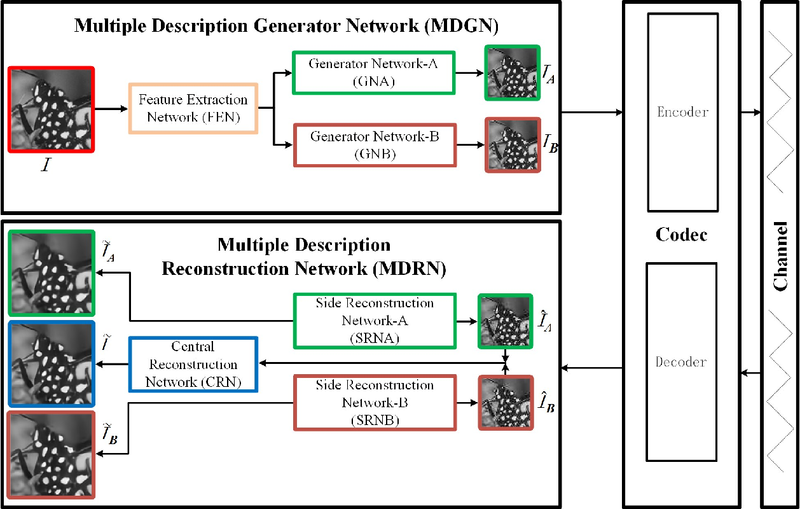 Secondly, we present multiple description reconstruction network (MDRN) including side reconstruction network (SRN) and central reconstruction network (CRN). When any one of two lossy descriptions is received at the decoder, SRN network is used to improve the quality of this decoded lossy description by removing the compression artifact and up-sampling simultaneously. Meanwhile, we utilize CRN network with two decoded descriptions as inputs for better reconstruction, if both of lossy descriptions are available. Thirdly, multiple description virtual codec network (MDVCN) is proposed to bridge the gap between MDGN network and MDRN network in order to train an end-to-end MDC framework. Here, two learning algorithms are provided to train our whole framework. In addition to structural similarity loss function, the produced descriptions are used as opposing labels with multiple description distance loss function to regularize the training of MDGN network. These losses guarantee that the generated description images are structurally similar yet finely diverse. Experimental results show a great deal of objective and subjective quality measurements to validate the efficiency of the proposed method. Although deep convolutional neural network has been proved to efficiently eliminate coding artifacts caused by the coarse quantization of traditional codec, it's difficult to train any neural network in front of the encoder for gradient's back-propagation. 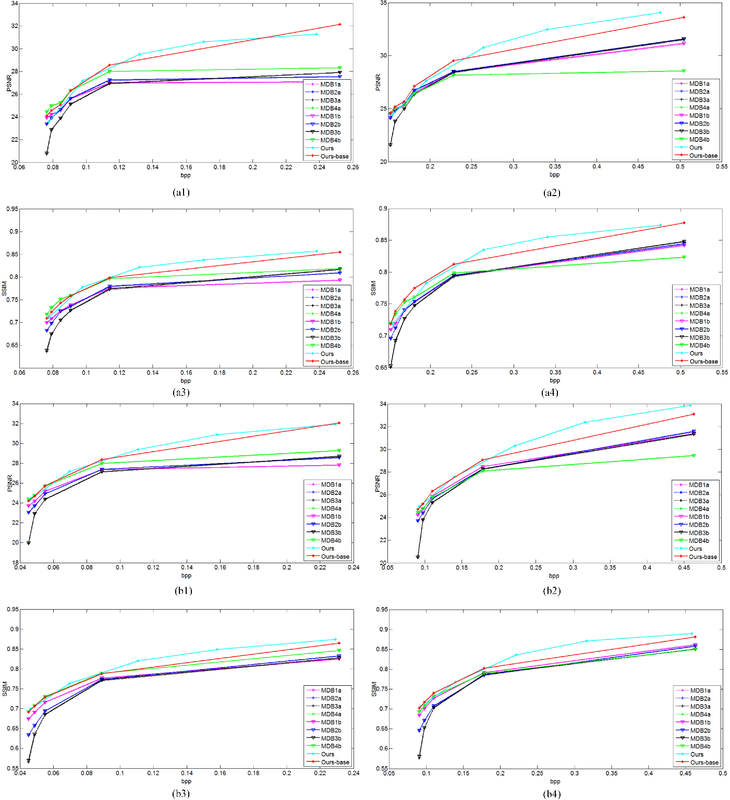 In this paper, we propose an end-to-end image compression framework based on convolutional neural network to resolve the problem of non-differentiability of the quantization function in the standard codec. 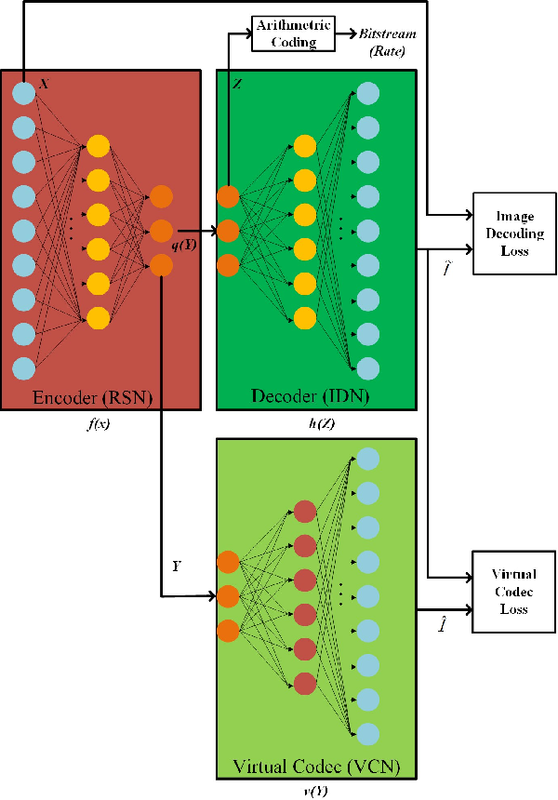 First, the feature description neural network is used to get a valid description in the low-dimension space with respect to the ground-truth image so that the amount of image data is greatly reduced for storage or transmission. After image's valid description, standard image codec such as JPEG is leveraged to further compress image, which leads to image's great distortion and compression artifacts, especially blocking artifacts, detail missing, blurring, and ringing artifacts. Then, we use a post-processing neural network to remove these artifacts. 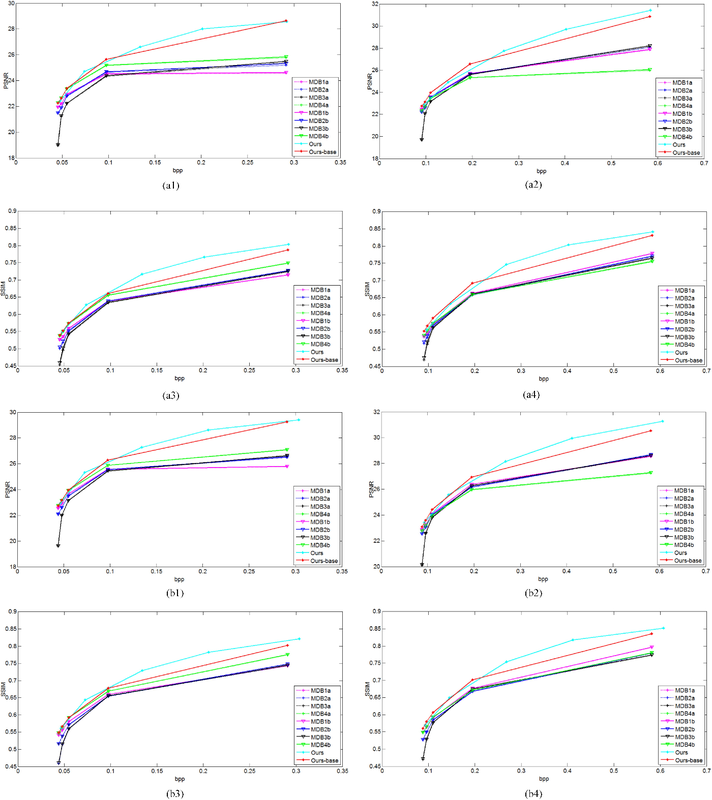 Due to the challenge of directly learning a non-linear function for a standard codec based on convolutional neural network, we propose to learn a virtual codec neural network to approximate the projection from the valid description image to the post-processed compressed image, so that the gradient could be efficiently back-propagated from the post-processing neural network to the feature description neural network during training. Meanwhile, an advanced learning algorithm is proposed to train our deep neural networks for compression. Obviously, the priority of the proposed method is compatible with standard existing codecs and our learning strategy can be easily extended into these codecs based on convolutional neural network. Experimental results have demonstrated the advances of the proposed method as compared to several state-of-the-art approaches, especially at very low bit-rate. In this paper, we propose an end-to-end mixed-resolution image compression framework with convolutional neural networks. Firstly, given one input image, feature description neural network (FDNN) is used to generate a new representation of this image, so that this image representation can be more efficiently compressed by standard codec, as compared to the input image. Furthermore, we use post-processing neural network (PPNN) to remove the coding artifacts caused by quantization of codec. Secondly, low-resolution image representation is adopted for high efficiency compression in terms of most of bit spent by image's structures under low bit-rate. However, more bits should be assigned to image details in the high-resolution, when most of structures have been kept after compression at the high bit-rate. 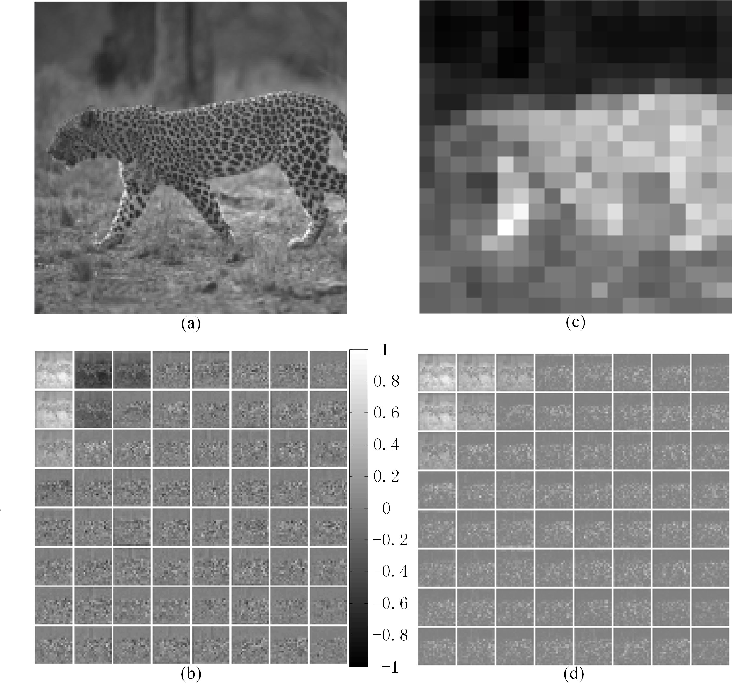 This comes from a fact that the low-resolution image representation can't burden more information than high-resolution representation beyond a certain bit-rate. 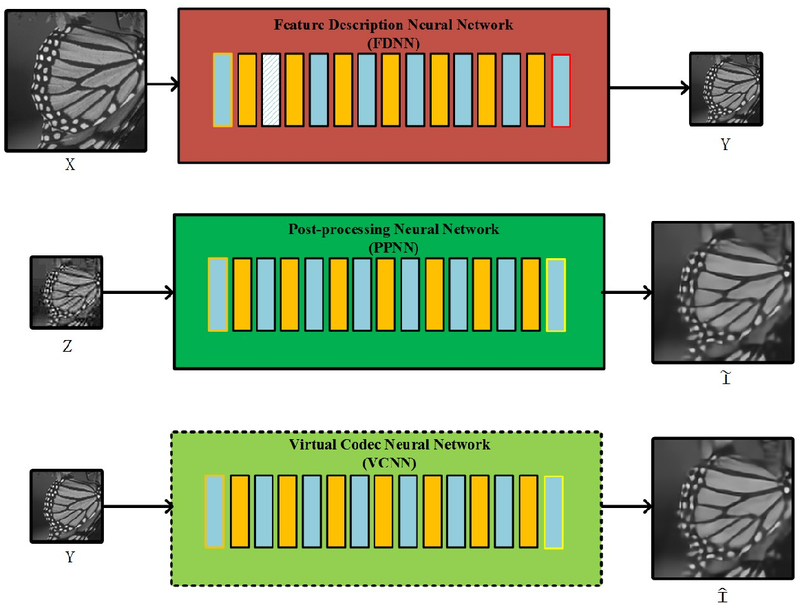 Finally, to resolve the problem of error back-propagation from the PPNN network to the FDNN network, we introduce to learn a virtual codec neural network to imitate two continuous procedures of standard compression and post-processing. The objective experimental results have demonstrated the proposed method has a large margin improvement, when comparing with several state-of-the-art approaches. In this paper, two local activity-tuned filtering frameworks are proposed for noise removal and image smoothing, where the local activity measurement is given by the clipped and normalized local variance or standard deviation. 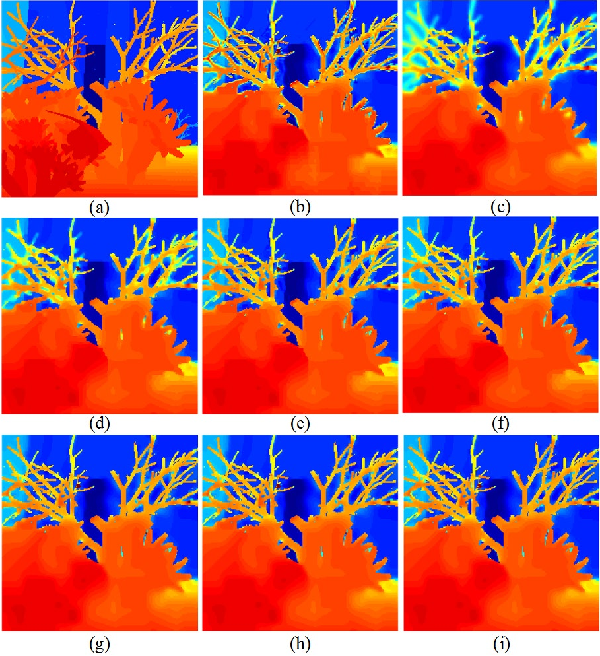 The first framework is a modified anisotropic diffusion for noise removal of piece-wise smooth image. 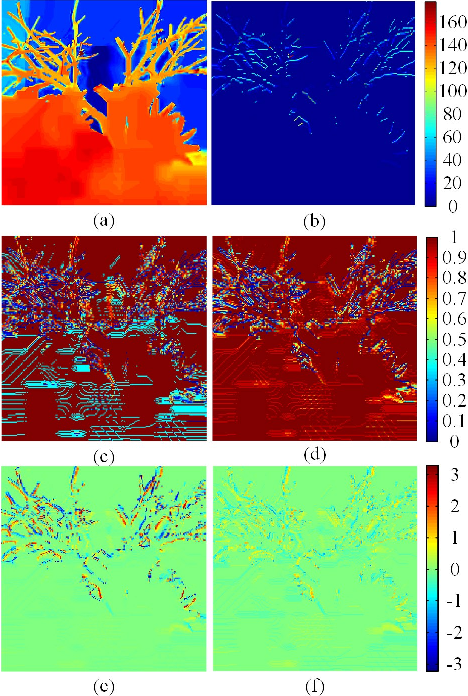 The second framework is a local activity-tuned Relative Total Variation (LAT-RTV) method for image smoothing. Both frameworks employ the division of gradient and the local activity measurement to achieve noise removal. In addition, to better capture local information, the proposed LAT-RTV uses the product of gradient and local activity measurement to boost the performance of image smoothing. 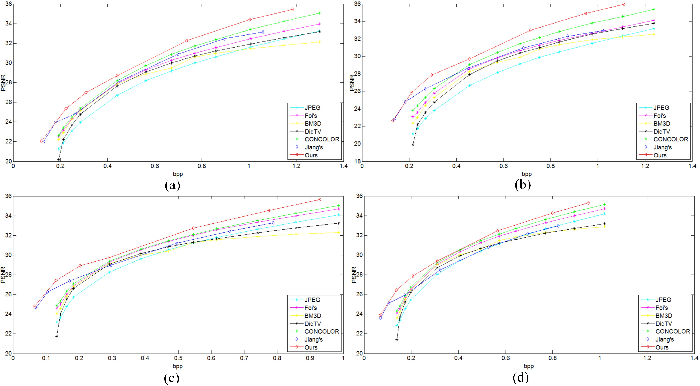 Experimental results are presented to demonstrate the efficiency of the proposed methods on various applications, including depth image filtering, clip-art compression artifact removal, image smoothing, and image denoising. Recently, Generative Adversarial Network (GAN) has been found wide applications in style transfer, image-to-image translation and image super-resolution. 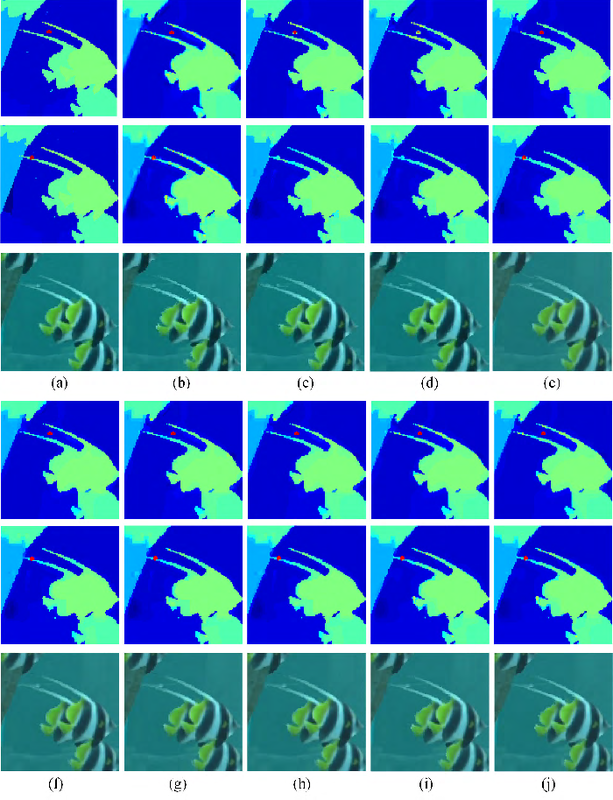 In this paper, a color-depth conditional GAN is proposed to concurrently resolve the problems of depth super-resolution and color super-resolution in 3D videos. Firstly, given the low-resolution depth image and low-resolution color image, a generative network is proposed to leverage mutual information of color image and depth image to enhance each other in consideration of the geometry structural dependency of color-depth image in the same scene. 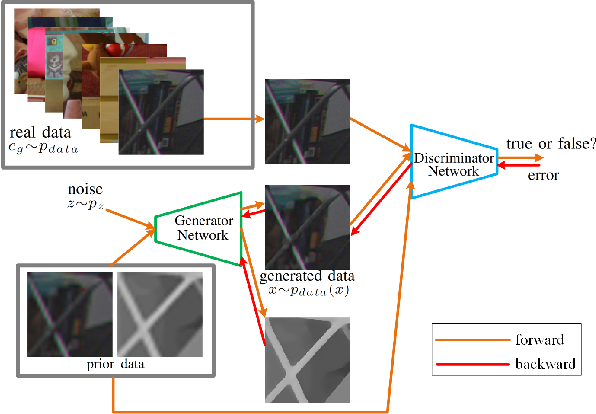 Secondly, three loss functions, including data loss, total variation loss, and 8-connected gradient difference loss are introduced to train this generative network in order to keep generated images close to the real ones, in addition to the adversarial loss. 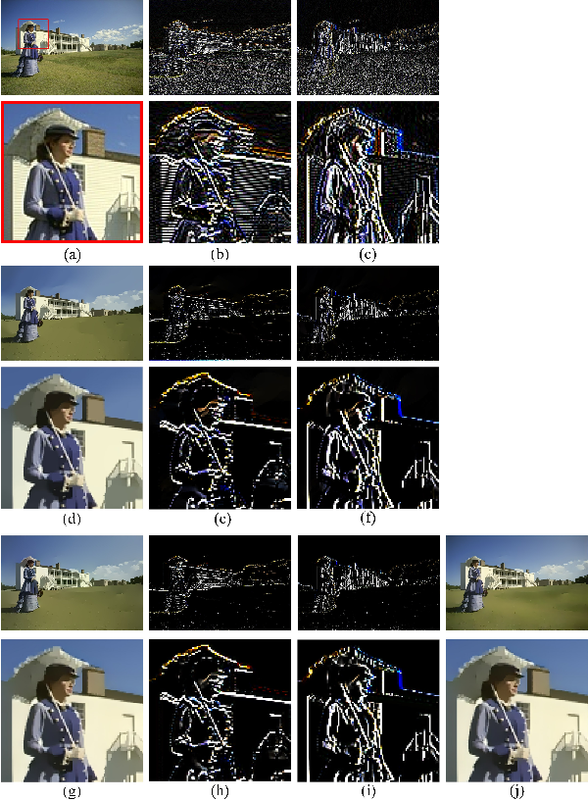 Experimental results demonstrate that the proposed approach produces high-quality color image and depth image from low-quality image pair, and it is superior to several other leading methods. Besides, we use the same neural network framework to resolve the problem of image smoothing and edge detection at the same time.